When you think of crucial conversations, what comes to mind? Is it a certain person, such as a boss or a significant other? Is it a certain topic, like raising your kids or managing finances? We all have certain people who we either struggle to communicate with (think: your teenager), or certain people with whom we often discuss very serious, sensitive subjects (think: your spouse, your business partner, etc.). In addition, we also each have a few topics of conversation that make us uncomfortable or nervous. It might be politics, it might be money, it might be discussions about the future or the past. 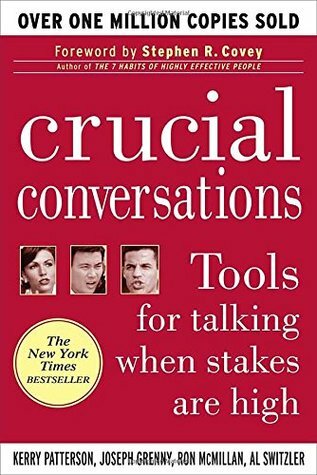 In their book, Crucial Conversations, authors Patterson, Grenny, McMillan & Switzler define a crucial conversation as one where 1) emotions run strong, 2) opinions vary, and 3) stakes are high (or the outcome has a big impact). Crucial Conversations presents practical and helpful ways to navigate these crucial conversations. It offers tips for the beginning, middle, and end of your tough conversations; troubleshooting for when your conversation partner doesn’t respond well; and plenty of examples of how the techniques can be used in real life. There are several specifications of “what to do vs. what not to do” which makes it very easy to understand. The book is written by a group of researchers who have spent years studying communication styles, and taking notes on people who communicate extremely well and what they do right. And the best part is they don’t write like researchers; the writing style is simple and effective, as if a friend was giving you advice. Moment of truth: I did not simply stumble across this book in a bookstore and think to myself, “I could use some improvement in my communication. I’ll buy this.” I actually purchased it per the suggestion of a family therapist I had been seeing with a close family member. This family member and I had been in constant conflict for quite a while, and despite having weekly sessions with this therapist, we were still highly combative when we spoke to one another. Something had to change and, though we didn’t know it at the time, that “something” was how we communicated. We needed to learn how to create healthy dialogue that did not include insults, sarcasm, and shutting down when things got tough. I purchased Crucial Conversations per the suggestion of a family therapist I had been seeing with a close family member. To my surprise and delight, I was able to read this book and genuinely apply concepts from every single chapter. My family member read it as well, and we were able to reference the book while processing past conversations that did not go over well, and determine how to communicate better in the future. Can you relate? Can you think of a conversation you had recently where things didn’t go so well, and you want to know what you could have done better? Is there a difficult conversation you need to have in the future, and you aren’t sure how to handle it? Is there a significant person in your life who you need to connect with, but you haven’t been able to? I would recommend this book to anyone age 16 and above, (and buy your own copy, because I guarantee you will want to re-read it and be able to refer back to it). I especially recommend reading it together with another person, perhaps your significant other, or assigning it to your whole team at work. If you’re having a hard time with a family member or loved one, I strongly recommend bringing your thoughts to a couples’ counselor or family therapist like I did. There are so many tools at your disposal when it comes to enhancing communication with important people in your life. Add this book and an excellent therapist to your toolbox of resources, and you’ll be amazed at how much your relationships can improve. Reviewed by Emily Hartl, Office Manager at Life Insight and Psychology Graduate Student. Life Insight offers offers psychotherapy, mental health counseling and coaching services for adults and adolescents in Hinsdale and Chicago’s western suburbs.